In February 2013 we headed back down to Disney as a family for the 2013 Disney Princess Marathon Weekend. I was on a flight with my parents and my sister was on a separate flight. Her flight arrived in Orlando by 10:00 am. She took the Disney Magical Express to Old Key West, which would be our home away from home for the next couple of days. 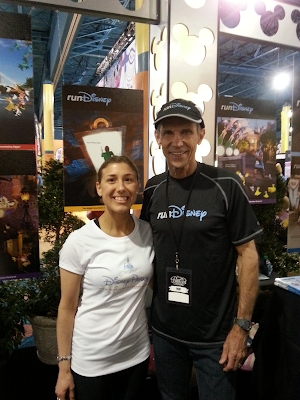 After dropping her bags off at OKW, she headed over to the race expo. 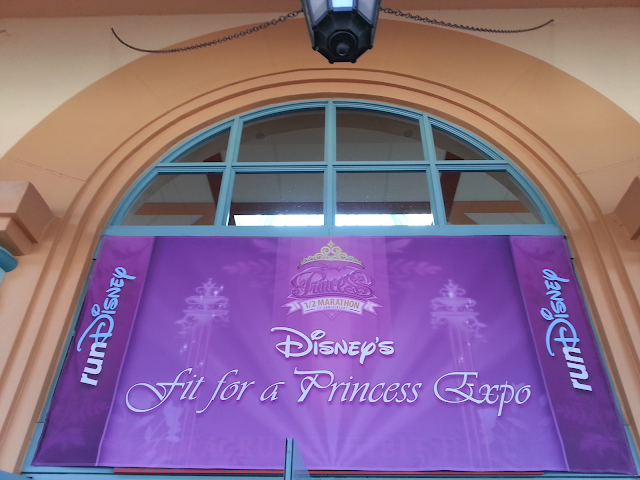 This year the expo was located at Disney's Coronado Springs Resort. It is usually located in the Wide World of Sports Complex but I heard that there was a conflict with the Atlanta Braves spring training schedule and a soccer tournament. I guess Coronado Springs was the best alternative. There are many conference/ballrooms available there. I've read on other blogs that people were kind of disappointed in the set up of the expo and thought it was too cramped and crowded. I personally did not mind it. I think the expos are ALWAYS crowded even if they are held at Wide World of Sports. I actually liked the fact that the sign in/bib pick up was in the same room as the t-shirt pick up ( it was only right around the corner). One thing I did not like this year was the fact that there was an actual line to get into the official Run Disney Merchandise tent. I do understand the purpose of why they did it that way though. It was really a small space. Having been at the expo the first day it opened, I didn't feel that they had a lot of Run Disney merchandise available. This seems to be the case at the expo last month as well. Either the merchandise is selling out quickly (which I would assume to be the case) or enough merchandise isn't being ordered and brought to the expo. 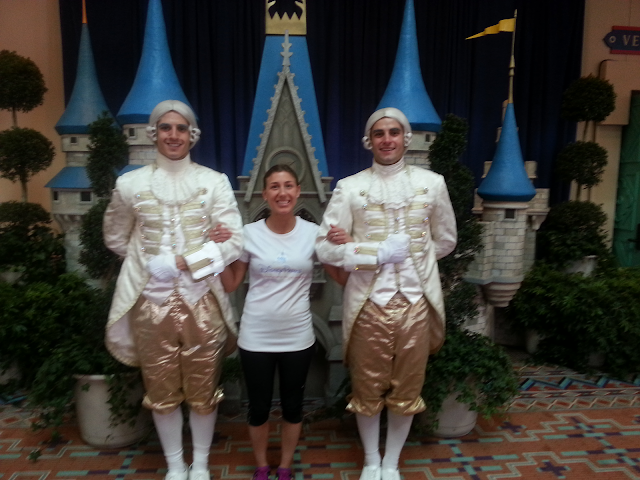 My sister had plenty of time to get her race essentials, shop the expo, and get pictures with characters that were set up outside the conference center. She also got to meet Jeff Galloway. She told him that I was using his method and they talked about that for a few minutes before snapping a picture and signing her race bib for good luck! By this time I was just arriving to Coronado Springs with my parents. We were starving after our plane ride, so we met my sister and went right to the Pepper Market for something to eat. The Pepper Market is a food court type restaurant at Coronado Springs resort. My sister and I both got the build your own Chef Salad and it was scrumptious! After dinner, we all walked back down to the expo so the rest of us could get our race essentials. Probably the highlight of the expo from this point on was meeting Ali Vincent from the Biggest Loser TV show. Ali was the first female winner on the show. My sister and I both love the biggest loser. We have all the cookbooks and I would use those recipes all the time in my nutrition class. We were so excited to meet her. She told us about her new upcoming show "Live Big With Ali" and told us about her goal of running 13 half marathons in 2013. She had already done the Disneyland half marathon last month and was now going to run the Princess half Marathon this weekend. I don't know what other races she has planned, but I hope she reaches her goal. I'm sure she will! She sent us off with an autographed pictures and a pink inspirational bracelet. Thank You Ali! What did you think about the Expo being at Coronado Springs this year?